Teaming with Rosemont Media, Houston plastic surgeon James F. Boynton, MD recently modernized his practice’s website with the intention of enhancing his visitors’ browsing experience while staying abreast of the ever-evolving digital age. Outfitted with a responsive design that seamlessly adjusts to fit the screen dimensions of any Internet-compatible device, the website features an innovative element known as parallax scrolling on the homepage, as well as a widescreen display and large imagery throughout each internal page. A distinctive component of Dr. Boynton’s website is the navigational menu located in the bottom left corner of every page. Contrary to traditional layouts that contain drop-down tabs in the header, the site menu pops up from the left side of the screen when clicked on, enabling visitors to choose the specific page they wish to access. Once a page is selected, the menu condenses back into a button in the bottom left corner, effectively providing more space for content to be displayed on the page of interest. In addition to this unique aspect, Dr. Boynton’s site also features prominently what he refers to as the “Boynton Bloom”. This flower-like logo represents the beautiful transformation that can be achieved through the delicate art of plastic surgery. Behind the scenes, Rosemont Media incorporated leading plastic surgery search engine optimization strategies into the content, videos, and overall design of the website. These SEO tactics are intended to help Dr. Boynton achieve – and maintain – a high ranking for key industry terms within his competitive online marketplace. 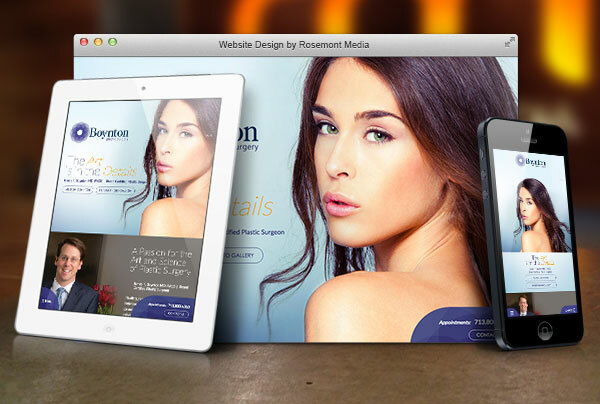 If you are interested in custom website design for your plastic surgery practice, we encourage you to check out www.boyntonplasticsurgery.com to view the type of site Rosemont Media can build for you.